This secured loan agreement is for use when the borrower is a company or other corporate body, or a trust. It is drawn so that lender is also a corporate body, but the lender may as easily be an individual or a trust. It is drawn primarily to protect the lender, but if you are the borrower, you have the opportunity to edit any point you would prefer not to include. The agreement may be for a loan by a family member to her nephew’s business; by a business angel who has also taken shares; simply an arm’s length “investment for interest”, or any other reason. We have provided for security in the form of physical assets to be lodged or described. There is also full provision for a personal guarantee. That may be more than the lender needs. If the right person, or people, will give a guarantee, that is more powerful than other forms of security but may lead to problems in enforcing payment. On the other hand six dumper trucks or a warehouse of DVDs may be easier to sell. The loan is “secured” by the borrower either taking physical possession, (example: Krugerrands) or leaving the assets where they are and describing them in detail in this document so that there can be no dispute as to what is charged (example: plant or machines). 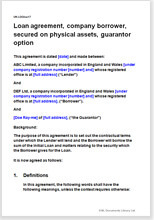 This document provides the evidence that the item is “secured” to the lender. Remember that a dispute as to entitlement is more likely to be against a liquidator or receiver than against the borrower. There is an option for the lender to have use of the security from time to time, as for example a property developer lends cash to a builder so that builder can buy materials, but lender wants to be able to use a mechanical digger for his business too as part of the deal. This option is all in one paragraph, so very easy to delete. Borrower to provide regular financial information.